One of the largest film studios in America, Universal Studios (often called Universal Pictures or Universal City Studios), is based in Universal City, a community in the San Fernando Valley, California. Universal was founded by a man called Carl Laemmle, who was of German Jewish nationality. He immigrated to Wisconsin in 1884, where, as the story goes, he was struck by the adoration of nickelodeons at the time. Today, we know the word 'nickelodeon' as the children's television channel, but in fact, the word describes a type of early theatre which was enjoyed in the early 20th century. Nickelodeons would show films which were typically fifteen to twenty minutes in length. Some examples of these are; "Catch the Kid", "Fatal Hand" and "The Coroner's Mistake". Laemmle, enticed by the possibility of profiting from the popularity of nickelodeons, purchased quite a few small businesses. Shortly thereafter, Laemmle and other peeved nickelodeon owners decided to produce their own pictures, in order to avoid the large fees which they had previously had to pay. After his creation of the Independent Moving Picture Company, he begun to change the way things worked, in the world of film. Previously, stars of films did not become quite as famous as they would nowadays, because they were never credited in movies. Laemmle changed this by naming his actors, thus attracting leading actors of the time. One could attribute the 'movie star' system to this one act of Laemmle. The actors were named, became famous and thus became movie stars. Later on, the Independent Moving Picture Company merged with smaller companies to become Universal Pictures Company, and went on to great success. From the very beginning of the success of the company, Universal offered tours of their studios. The tours, over the years, grew into a theme park, which is how we know it today. Everything at Universal Studios Hollywood has a movie theme, and of course, all the themes feature Universal films. The attractions at Universal Studios Hollywood are split into two areas on different levels, connected by a series of escalators. 'Fear Factor Live', 'Shrek 4-D', 'Waterworld', the Studio tour, 'Back to the Future: the Ride', 'Monster Skate Park' and 'Blues Brothers R&B Revue'. 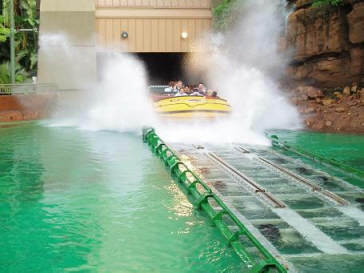 In the lower area are the following attractions; 'Special Effects Stages', 'Revenge of the Mummy: the Ride', 'Backdraft', 'Jurassic Park: the Ride' and 'Lucy: A Tribute'. The park is open daily except for Thanksgiving and December 25th. Reservations are not necessary but will save you time. Prices range from $51 for a one day children's ticket, to $235 for a Southern California Citypass, with which a visit to Universal Studios is included. The park is understandably busiest in Summer, which would be the worst time to go, as you will also have to contend with smog and heat. The best time to visit is surely Spring or Fall.